Eugenius Alfred Roche was at the school for barely 18 months. He was a member of Grant’s House, and after leaving the school in August 1868, trained as an army surgeon. He served in the Afghan War between 1878 and 1880. He reached the rank of Lieutenant Colonel by 1897 and retired from the army 10 years later. He married Louisa Forbes in 1888 and had four children. It is perhaps as he served abroad that we have relatively few records of his life. 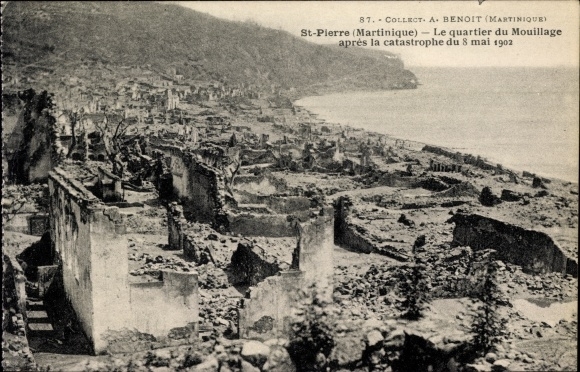 Roche was thanked by Secretary of State for Colonies on the occasion of the destruction of Saint-Pierre, Martinique, by volcanic eruption in 1902, for his ‘ready and valuable assistance’. 28,000 people died as a result of the eruption. It remains slightly unclear why Roche is included on the school’s war memorial. He died at home in Brighton, aged 65 and was not in active service. However, it is possible that he did serve during the war in a medical capacity, and his death might have resulted from this work. This entry was posted in The Fallen and tagged Afghan War, Brighton, Grant's, Martinique, Royal Army Medical Corps, Saint-Pierre. Bookmark the permalink.